Engevita Nutritional yeast is a deactivated yeast which as the name suggests is a great source of nutrition, especially rich in B vitamins. When used as a condiment it give a cheesy nutty taste to all kinds of foods. It is readily dissolved in water, milk, fruit or vegetable juices and can be sprinkled on soups, stews, casseroles, salads and breakfast cereals to enhance the flavour. Nutritional Yeast makes a great popcorn topper or add it to mashed or fried potatoes, shake it into scrambled tofu or eggs. Nuchos.co.uk only supply the premium nutritional yeast Engevita® It's vegan, gluten free and rich in vitamins, minerals and an excellent source of protein. Nutritional yeast is grown on vitamin and mineral enriched molasses. At the end of the growth period, the culture is pasteurized and dried to deactivate the yeast. 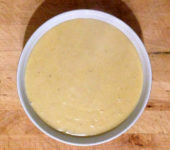 The resulting nutritional yeast can be added to a variety of recipes to enhance taste, texture, and nutritional value. The inactive yeast will not continue to grow in the intestine and use up the nutrients. Hence, it should not be confused with active yeast, which is used in bread, beer and wine making, which if eaten as is, would continue to grow in the gastrointestinal tract and use the nutrients from food, robbing the body of valuable nutrients. Nutritional yeast is used as a food ingredient or as a supplement to improve nutrition. It has a pleasant nutty-cheesy flavor and is rich in protein, B vitamins and minerals.